Given away to hundreds and loved by all. Mama was alive when I posted this in 2011 and she did smile. She wanted us to learn to make this cake. I think that a few in our family have mastered it and I am told that I have as well. I'm glad to pass along this love of a family favorite that she instilled in us. 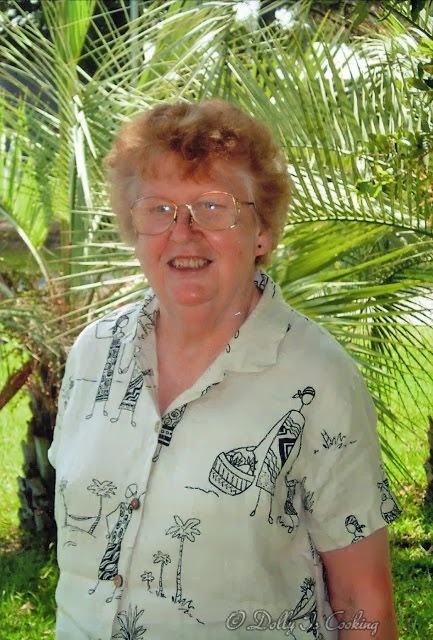 We Miss you mama and you're always with us. My try at her cake. It has been my experience that any two people can make the same recipe and they will taste different. Everyone's taste different but delicious. The Johnson men loved pound cake. Needless to say from Grandmother Johnson on down each had their own pound cake recipe. I guess it is being passed down this love of pound cake to all of us. This is my Mama's recipe I spoke of in the last post. Add eggs, one at a time, beating until mixed before adding another. do this after each egg addition. Bake for 1 hour and test with toothpick for doneness. It usually takes mine about 1 hour and 20 minutes. Then turn cake over to cool other side. famous crust. She can make the top with the most crust ever!!! The cake looks wonderful. I have a kitchen-aid that I love to. I use it all the time. But I will have to get that padel for mine I still have to scrap. I am going to try that recipe. Will let you know how I do. Hi Michelle, Glad you came by! You will love the cake and the beater too. Let me know how it turns out for you..
Mmmmm, Mmmmmmmm, Good! Boy am I getting hungry for something homemade and sweet! I'm your newest follower. Thanks so much for visiting and following at my blog. Tell Mama Dot she can come visit my kitchen any time she likes! So nice to meet you. Well Thank you Julie, I will have to pass that along to Mama Dot. So glad to meet you. Come back anytime and I will be visiting you too. I love my KitchenAid and my beater. It makes it so much easier to mix a large pound cake. Your pound cake is beautiful. The lines on the top are interesting. Do you turn it out onto a wire rack & then put it on a plate? I love this site, and love cook books. Mom looks great Dolly. Hi Angie, Those are because I left it too long on wire rack while I was on Facebook...lol It is not supposed to look like that. Yes after it cools in pan about 15 minutes I put the cake itself on rack to cool and was supposed to turn over sooner to cool other side, but didn't until lines formed...thanks for stopping by. Thanks you for the compliment whomever you are. I would enter you in cookbook giveaway if I only knew who you were. Your cake looks closer to my grandmothers than any I have seen! 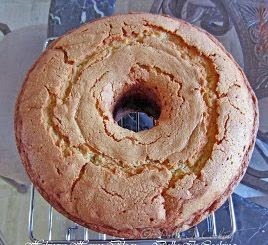 I make a good tasting poundcake but cannot get that crust! Is there a secret for that? The Sour Cream I think gives it that. Hi, my name is Angelia and this cake is a thanksgiving and christmas staple that I make every year. My mom used to make this cake but I started doing it at the early age if 13 and my family goes crazy over this cake. 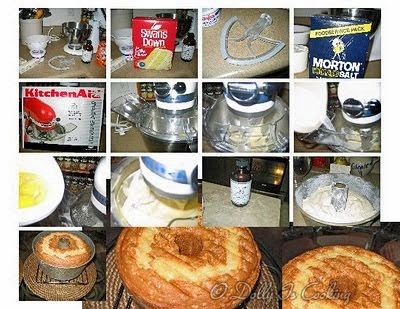 If this cake and one other one isn't made during thesw times if the year, I will never stop hearing that there was no sour cream pound cake, what happened to her? So this is a must cake that has to be made. It us always moist, buttery, and delicious. I have been known to make this cake throughout the year for other ocassions also. Just to let you know how much my family and friends love this cake. Thanks for all you do in sharing your recipes. I can't thank you enough for such sweet sentiments. I love to hear about others and their traditions. We are all alike in so many ways. Merry Christmas to you and your entire family. One of my most requested cakes also. My recipe is a bit different though: I sift the Swan's cake flour before measuring, add the soda to the sour cream before mixing into the batter, no salt, add 1/2 teaspoon almond extract and bake at 300 degrees for 90 minutes. Perfect "crust" every time. My fiancé says it's like an angel food cake and a pound cake had a baby. That does sound great! I will have to try it! Thanks for sharing.